HINCHINBROOK (AUS) (Bay 2007-Stud 2011). 2 wins at 2, AJC Skyline S., Gr.3. Leading Aust. First Season Sire 2014-15. Sire of 213 rnrs, 127 wnrs, 11 SW, inc. Press Statement (BRC JJ Atkins S., Gr.1), Whispering Brook, Derryn, Diamond Tathagata, Salsonic, Samara Dancer, Flying Jess, Spright, Flippant, Manaya, The Virginian, SP Beat the Clock, Knowable, Super Too, Brazen, Brooklyn, Old Trieste, Un de Sceaux, Brulee, Nina Peak, Brooklyn Storm, etc. CAN SHE MOVE, by Canny Lad. 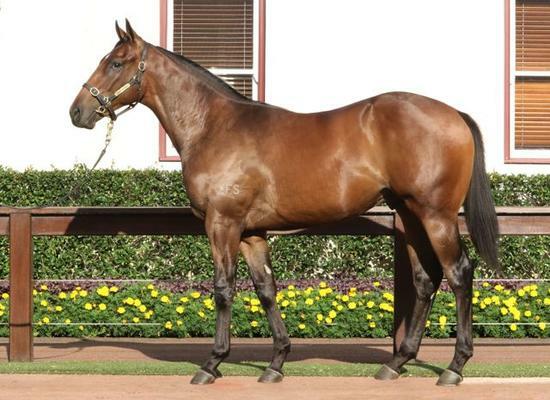 2 wins at 1200m, 1650m, BRC Powerade H. Dam of one named foal. Divine Service. 8 wins-1 at 2-at 1000m, 1200m, A$303,400, to 2016-17, BRC Chris Anderson Racing H., Channel Seven 2YO H., Duporth Tavern H., SCTC Access Insulation H., 2d BRC Sky Thoroughbred Central H., Ipswich TC Sirromet Wines Bundamba 2YO P., Rockhampton JC Newmarket H., 3d BRC Racing Retro 2YO H., Bartons H., Qld Tatt's RC Hardy Brothers Jewellers H., BRC Heat 6 Origin Jockey Series P., St Vincent's Palliative H., Gallopers Sports Club H., Giddy Up Club Membership H.
Widow's Walk. 6 wins to 1300m to 2016-17, BRC Bundaberg Distilling Company H., Powerade P., Wayne Wilson H., 2d Ipswich TC Ray White H., 3d BRC Brc.com.au H.
Zendaye. 5 wins-1 at 2-at 1200m, A$84,175, to 2017-18, BRC Brc.com.au H., Join Our Stable P., Ipswich TC City of Ipswich H., 3d BRC Girls Day Out H., Girls Day Out Raceday H.
Happy Chappy. 2 wins-1 at 2-at 1000m, 1200m, HKJC Queen's Road Central H., Jinyu Hutong P., 2d HKJC L'Oreal Paris H., 3d HKJC Arbuthnot P., One Country, Two Systems P.
Can She Move. 2 wins. See above. Fortune Star. Winner at 2 in 2016-17, 3d GCTC Langs Building Supplies 2YO H.
Cointreau Ball (Snippets). 6 wins to 1550m, A$113,150, MRC Flinders H., SAJC Feltex H., Christmas Twilight at Cheltenham H., Bell Potter Securities H., Seppelts Fleur de Lys H., 2d MRC Textile H., SAJC Lakewood Stud H., 3d SAJC Queen Adelaide S., L, Waterford Crystal Flying H., Dunlop Flooring H., Schweppes H., Christmas Twilight at Victoria Park H.
Sonic Barrier. 6 wins from 1000m to 1600m, R298,365 in South Africa and Zimbabwe, Turffontein Racing Association H., Computaform Express H., Vaal UK Soccer H., 3d Vaal Hospitality Reservations H., 4th Borrowdale Gold Cup Sprint, L.
DANCING DYNAMITE (Yeats). 7 wins-2 at 2-at 1200m, 1400m, A$308,770, VRC Crown Casino S., Gr.3, Qld Tatt's RC Mercedes-Benz S., L, 2d AJC Stan Fox S., Gr.3, STC Skyline S., Gr.3, Gosford RC Pacesetter S., L, 3d STC Theo Marks H., Gr.2, AJC Brian Crowley S., L, June S., L.
SALSONIC (Hinchinbrook). 2 wins at 1300m, 1600m, A$345,500, in 2016-17, BRC Queensland Guineas, Gr.2, 2d ATC Hyland Race Colours 2YO H., Tab.com.au P., 3d Hawkesbury Guineas, Gr.3, ATC Spring S., Gr.3. BUMP AND RUN (Kenvain). 10 wins from 1400m to 1800m, A$136,535, NSW Tatt's RC Tattersall's Club Cup, L, AJC Lord Ben H., GCTC Von Bibra H., STC Hahn Premium Light H.
RAZAMATAZ (Prego). 10 wins to 1200m, A$188,240, SAJC Malaysia Airlines S., L, Barossa Under Stars H., 2d SAJC DC McKay S., Gr.3, Oakbank RC Clipsal S., L.